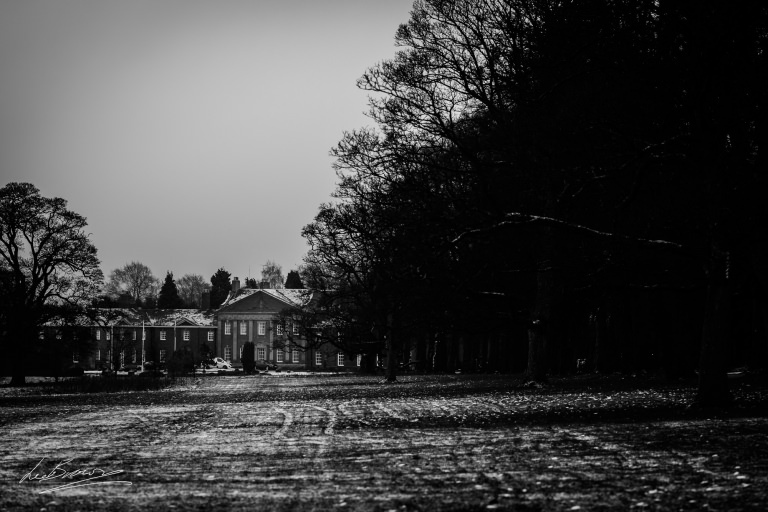 When I arrived at Mottram Hall on Saturday for Jane and Sam’s wedding I was met by a magical covering of snow and a mist that made the venue look like an enchanted mansion. 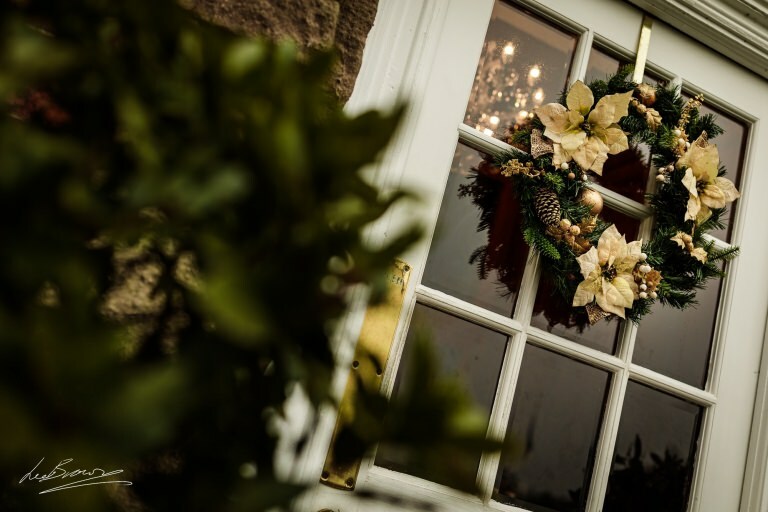 This Winter Wonderland Wedding at Mottram Hall was so unique. I just knew from then on it was going to be a special day. I certainly wasn’t wrong. Jane and Sam are one of the loveliest couples I’ve had the pleasure of photographing this year. There was so much love for them at their wedding. They’d splashed out on beautiful gifts for each other, their bridal party and the groomsmen. It was so nice to see everyone in such high spirits as they got ready. Jane’s bridesmaids, Nia, Marie, and Ruth swapped their matching pale grey robes for long elegant dresses. Meanwhile, the groomsmen donned their patterned ties with sharp tweed waistcoats and navy blue suits. 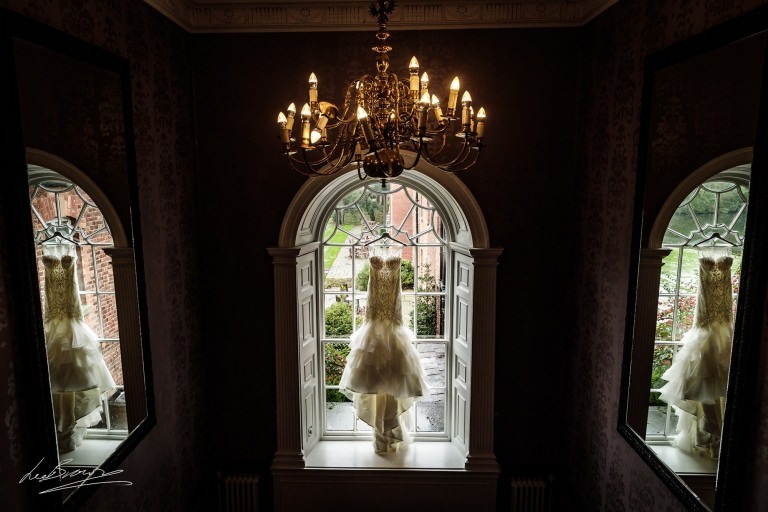 Jane had kept the dress, from Elegant Bride Nantwich a total secret from everyone involved so did a grand reveal of the beautiful beaded gown with a ruffled skirt for her friends and family. She looked stunning! With the addition of a fur capelet to keep her warm in the snow and a birdcage veil, there was hardly a dry eye in the house when everyone saw her for the first time. Beautiful florals lined the candlelit aisle culminating in a flower arch filled with cream and pale green roses expertly styled by Lasting Memories By Alison and it was an emotional reunion as Sam and Jane met to say their vows. After the ceremony, the loved-up couple headed out on a romantic drive. The room was transformed into an elegant winter wonderland! It had candles galore and table centerpieces of more roses and cascades of crystal. Whisky graced every table. The table cards featured diamonds and pearls. Lasting Memories by Alison couldn’t have done a better job, the room looked incredible. Jane given the weather changed into special bridal trainers. This allowed her to get to the rose garden for bridal portraits. I shot some beautiful images of them together in the snow then, it was back in to warm up. (It was getting pretty chilly by now) Finally, beginning the wedding breakfast. Speeches were done before we all sat down to eat. I love it when this happens! So, there weren’t too many nerves rattled. A best man, Lee, told his funny stories about Sam. The speeches were lovely and heartfelt and I spotted a few tears around the room. This was before, bride Jane, surprised us all again with her own speech. 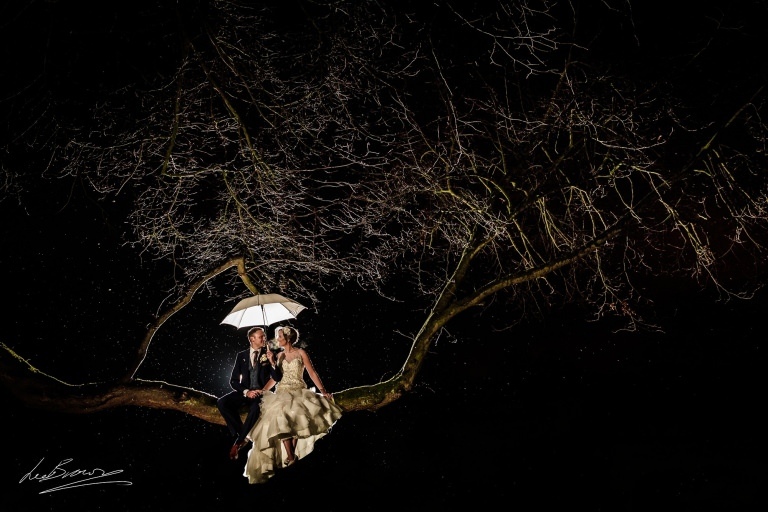 We managed to nip out again in the dark to get an amazing (and slightly precarious) shot of the newlyweds in a tree and Sam, Lee and Dad Ernie managed to enjoy some whisky and cigars before it was time for the first dance, a confetti canon and entertainment from X Factor’s Ollie Marland and Knights of Disco. And of course the cake of cheese by Church Mouse Cheeses. A blackjack table and Jane’s very own Prosecco bar kept the late night partiers going with waffles for those who needed extra fuel for their winning streaks. Congratulations guys, a beautiful winter wedding enjoyed by two of the nicest people I’ve met all year.